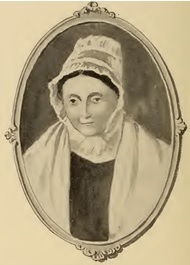 Elizabeth was born at Newbold in 1776 to Thomas and Mary Tomlinson. Before she was a year old her mother died and, on her death bed, committed her daughter to the Lord. The knowledge of this deeply affected the whole of Elizabeth’s life. Her father was a member of the Griffydam Wesleyan Society and, as a child, she was taken by him to the recently erected chapel there. Even at a young age, she actually listened to the sermons and was able, in later life, to recall some of them and the texts upon which they were based! At 14 she left Newbold to commence work in service at Derby before later moving to Nottingham to become a lace mender – a highly skilled occupation requiring great dexterity. On Easter Tuesday 1797, she chanced to attend Beck Barn, Nottingham, a temporary meeting house for the Wesleyans, where the revivalist minister, Rev George Smith, was taking the service. She underwent a deep spiritual experience and so began a new life for her. She dedicated herself to ministering to the sick (as a result of which she caught typhus herself), the poor and the condemned. She counselled Mary Voce who had been sentenced to death for murdering her child and accompanied her to the gallows. She then commenced her mission work in south Derbyshire and spent time in the Burton Circuit where we are told the young minister and the circuit steward busied themselves to hinder her work. It seems the minister concerned was the Rev Jonathan Edmonson later to serve in the Ashby Circuit and as President of Conference in 1818. Nonetheless, her message stuck a chord with ordinary Methodist folk wherever it was heard be it in a chapel, cottage, barn or in an open field and many were brought to the Lord. 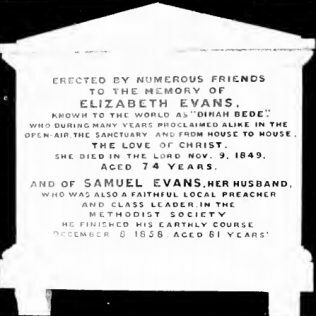 It was while visiting Ashbourne that her preaching was heard by Samuel Evans, a local preacher and class leader, who wooed and married her in 1804. Between them they took the Gospel to such places as Derby, Royston, Ellastone and Millhouse and would walk as many as 15 miles on a Sunday to preach in some far flung hamlet. 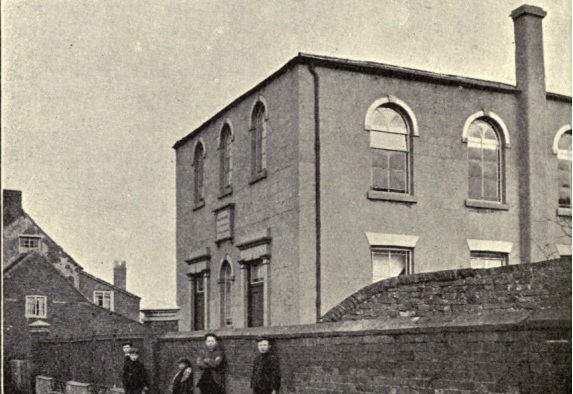 Their paths crossed with that of Hugh Bourne, co-founder of the Primitive Methodist movement, who was impressed with them both when he heard them preach at Wooton. Of Elizabeth he wrote ….and from the little I saw of her she seems to be as fully devoted to God as any woman I ever saw. O Lord, bless and establish her. She and Samuel finally settled in Wirksworth and were parties to a great revival there. Sadly, the opposition to women preachers evident during her ministry in the Burton Circuit resurfaced. She and a fellow local preacher, Mary Taft, were singled out by two leading figures at Conference who directed that they would be allowed to carry on preaching but only on condition that their names did not appear on the Plan, their appointments to be delineated by an asterisk. This was unacceptable to Elizabeth and she and Samuel joined the Arminian Methodists or Derby Faith who had no reservations whatever to the Gospel being preached by women though in later life they re-joined the Wesleyans. She died in Wirksworth in 1849 to be followed by her husband nine years later. The woman who spent her girlhood in Newbold, was taken by her father to Griffydam Wesleyan Chapel and became one of the great woman preachers of the early 19th century was immortalised by her husband’s niece, Mary Evans, who felt prejudice herself as a female author and so wrote under the pen name of George Eliot in order that her works would be considered seriously. In her novel Adam Bede, Dinah Morris, the preacher of the memorable sermon at Hayslope in Chapter Two, is essentially Elizabeth Evans and Seth Bede, the man she marries, Samuel Evans. Having just re-read George Eliot’s Adam Bede, I am glad to know more about the inspiration for the character of Dinah Morris. But I have elsewhere heard that the character of Adam was inspired by Eliot’s father, not her uncle.